A freshman comes into town…..
Raised in a small town bourgeois family and recently graduated from college in humanities, Edgar Delacroix has yet to discover what the big city has in store for him. After a fortuitous entry in the world of private investigation, he has to deal with twisted and suspicious individuals, solve sinister mysteries and risk his life in rather unpleasant circumstances. Both a financial and industrial metropolis, a center of vice and alcohol smuggling, Montreal in the twenties has all the assets to cater to the needs of criminals with any amount of imagination. The seamiest intrigues will be Edgar’s daily bread and cold sweat his squalid, bitter butter. Using the 7th Art’s visual language, Carte Blanche offers an experience akin to cinema, and especially its less advisable genre – the classical Hollywood Film Noir. 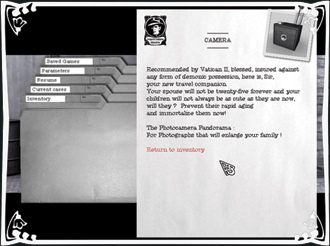 Carte Blanche is also certainly the first video game to offer a cinemascope format and a deliberate choice of black and white. 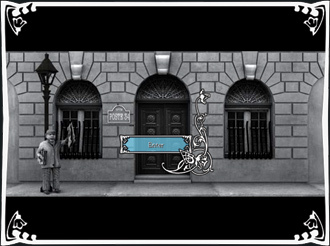 Depending on the player’s actions, Edgar will gain specific proficiencies and items which will follow him from one episode to the other. 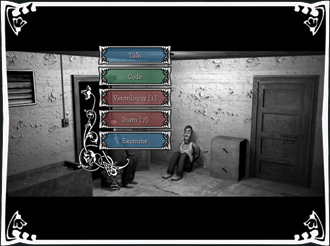 As the episodes go by each character progress differently, developing in accordance with the player’s style, thus making each session unique. Can you do that in the Myst series? No? Well there you go! Saving the world from the claws of abject individuals doesn’t mean you can’t have fun. In fact, it doesn’t mean you can’t have lots of fun! Although real life is at times crazy and absurd, Carte Blanche’s universe brings these fields to new heights – more than the Eiffel tower, Himalayas and Shaquille O’Neil combined! Since reality is often stranger than fiction, we give Carte Blanche to the player to reinterpret the Roaring Twenties in his own way, stomping on old cigarette butts as well as his childhood’s lost innocence in the process.